Each year, Urban Decay gives away a free eyeshadow single of your choice to UD Beauty Junkie Members. Each year, I obsess over what color to choose – and for the past two years in a row, I mistakenly selected the same color (Urban Decay “Laced”) because I didn’t realize in my massive makeup collection that I already owned it and was not using this shade that just looked OK, nothing special on me. So now there is TWO of them sitting in my makeup collection unused. And worse than that, I have several dupes of that shade from other brands laying around unused as well. When faced with a dizzying array of shades of lippies, liners, shadows, and polishes at Ulta, MAC or Sephora, what do you already own the exact match or a dupe of at home in your palettes and quads? Are you attracted to the same basic lipstick or nail polish and repeatedly buy basically the same thing? What have you tried and felt meh about? What shadows in a palette sit unused while other shades have hit pan? Which lipstick is it that you always get compliments when you wear it? What looks amazing on you? Empower your color selection with the Sortly app. 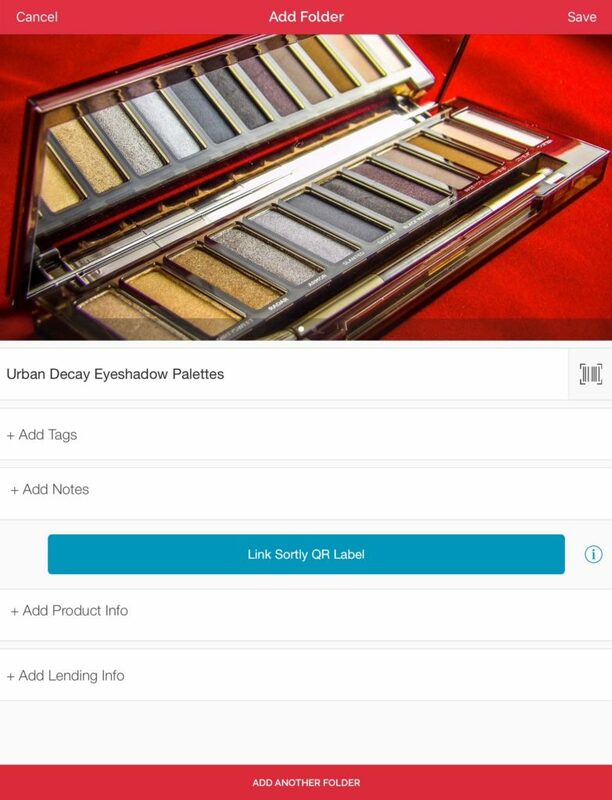 Sortly is a free iOS Organizing app that makes sense of your makeup collection. It is a highly intuitive app that is easy to use and makes organization easy and fun – no more wondering if you have the exact right lipstick color, you can just check the Sortly App to find the perfect pink gloss in your makeup stash. You can also access your data via the Sortly.com website. 1) I like to organize everything into very specific categories, like Eyeshadow Palettes or Red Lipsticks. Start by adding a Folder and naming it. 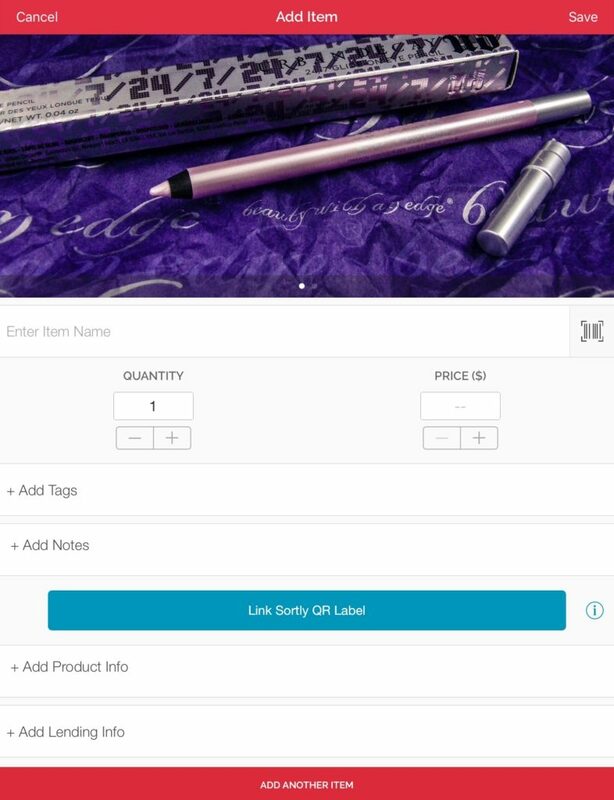 Add tags to help you find items easier, such as eyes, eyeshadow, smokey eye, etc. Add whatever tags will make it easier for you to find an item from your collection. 2) Add images. You can take a picture of an item from the app or you can upload one from your library. Do you have a selfie wearing a specific shade? Add that to the pictures! 3) Add notes. Do you have any specific application techniques? Does the color match a certain outfit? Add information that will help you find the shade you are looking for. 4) Add a QR code to the item. Sortly gives you a QR code to be printed and applied to the item. 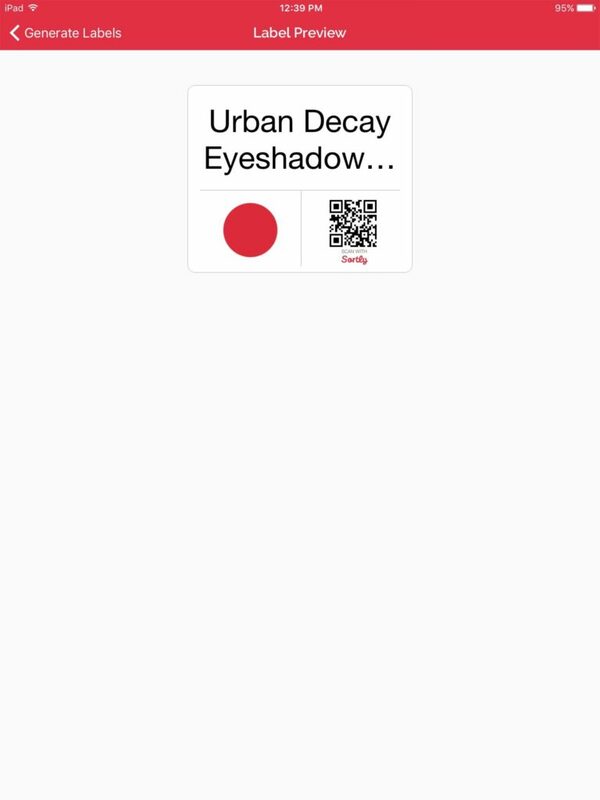 So if you are looking for one specific shade within a shadow or lip palette or the lipstick you were wearing in a selfie, you can put a label on an item (or a box of items) and scan it to see if you found the right one. No more opening up every eyeshadow to find the right one! 5) Add specific items. Add an individual item, and add details like the price, the best place to rebuy it, etc. Don’t forget pictures and individual QR codes! 6) Add labels when packing items away. I just picked up eight of my favorite lip stain that has been discontinued (sniffle). I packed them away for safe keeping and added a label that Sortly generated for me. It let me add the info I needed to know what is in the box, it let me add a title, information and even let me pick a symbol to put on the label so it is easier to find. 7) Add “throw-away” dates. I like adding the date I should throw away an individual item under “Warranty Expiring”. I used to put the date that an item should be tossed on a piece of tape on the item, but I often found that the ink wore off after a few weeks if I handled the item often (like mascara), so that wasn’t a great solution. Sortly clearly tells me when it is time to replace an item. I really enjoy this feature when I am headed to Sephora or Ulta and am looking to see what needs replacing soon, rather than just running out or realizing an item is expired. Then I can plan my shopping trips or online orders, and stock up on items so they are on hand when I need them! 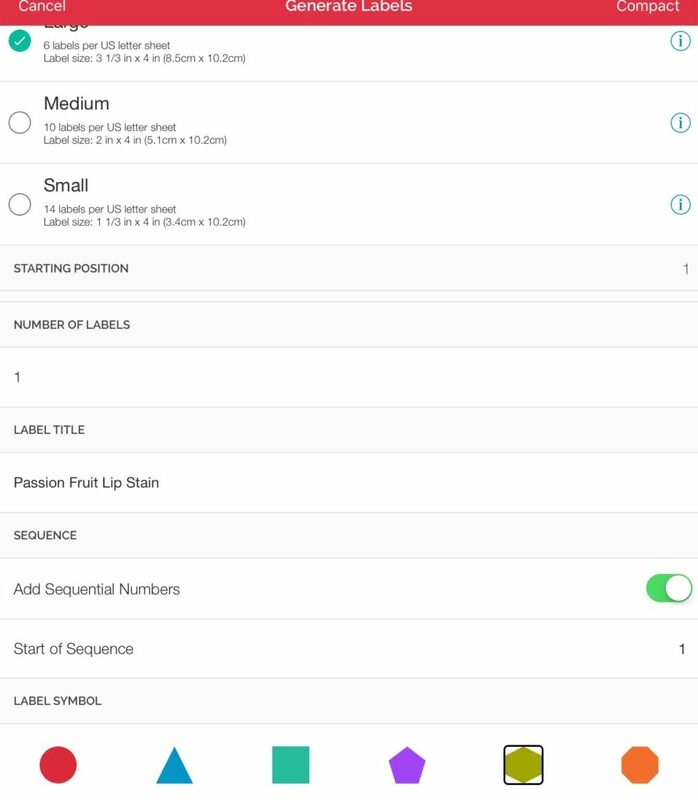 I never really got into Makeup Apps for organization purposes until I tried Sortly. Sortly makes easy work of organizing a large makeup collection like mine and makes it easy to find the exact shade or look I am seeking. I love that I can access my collection via the app or my browser through the Sortly.com website and that I’m not forgetting makeup that looks great on me but that I forget that I own! Style Chicks received compensation in exchange for our unbiased review and for our time and effort. However, our experience with the product and the opinions expressed in this review are 100% ours.